Autism Cruize-In at Jim Dandy Drive-In Tuesday, April 2, 2019 from 5-9 p.m. The White House all lit up in blue for Autism Day. From the ocean to the sea to the sky, we all usually see blue, but in the month of April, many people are looking for the blue that represents Autism. People may see more of this blue on April 2nd as it is worldwide Autism Day. 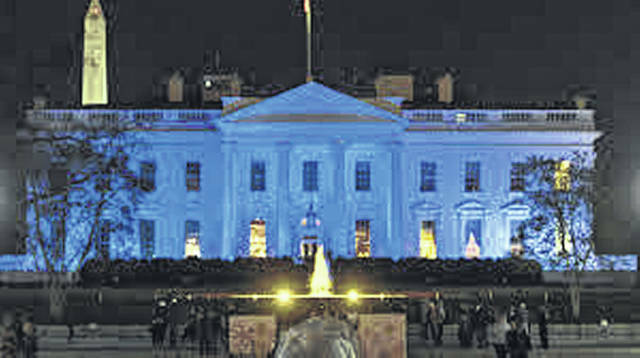 The public will see on this day, pictures of the Taj Mahal, Eiffel Tower, Niagara Falls and the White House in Washington D.C. all will be lit up in blue for Autism Day. The Autism Project of Southern Ohio will be holding their own autism awareness event again this year at the Jim Dandy Drive-In in Portsmouth. Mike Bell of the group, says, “This gives the opportunity for the community to come together with the autism community and unite in the awareness of autism,” said Mike Bell of the autism group . The Autism Project is a nonprofit 501C3 organization. This is the seventh year for the event and fourth at Jim Dandy’s. 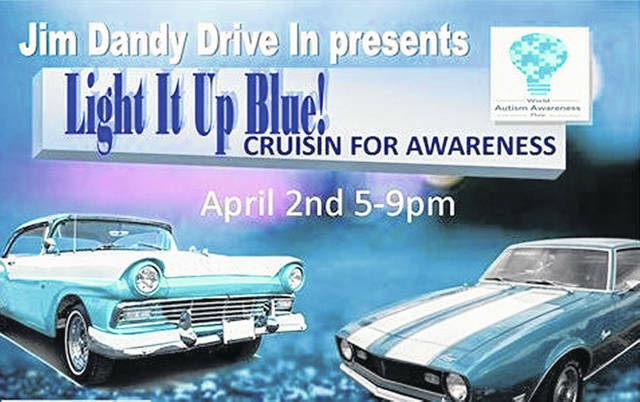 The group’s annual Light It Up Blue for Autism Awareness is from 5 to 9 p.m. Tuesday, April 2nd at the Jim Dandy Drive-In Portsmouth. This ‘Blue’ event itself, will have a cruise-in, and DJ from KC productions, plus there will be multiple vendors and food that will be on-site with different products to sell. The event is a celebration for autism awareness. Bell wants everyone to know it’s a celebration — there is no cost. Organizers just want people to celebrate with them. Bell also encourages everyone to wear blue throughout the month, whether it’s one of the blue T-shirts, or purchasing a blue light bulb at the hardware store for outside lights. He says the light bulbs show your neighbors that you support autism. The CDC (Center for Disease Control) has just changed the statistics of autism from 1 in 65 school ages kids diagnosed with autism to 1 in 48. . April is also Autism Awareness Month. There will be multiple events throughout the country, including locally, during the month of April for Autism. The Autism Project of Southern Ohio is located at 1018 Waller Street. The organization will also be holding its 17th annual Walk for Autism at Millbrook Park in New Boston, from 11 a.m. to 4 p.m. on May 4, which Bell says is just a day for fun. At this event, the admission is free. There will be vendors, games, music, and an auction, along with the walk. Registration starts at 10 a.m. and the Wall itself, will be held at 3:00 p.m. that day. All of the proceeds from that day will benefit the Autism Project of Southern Ohio. Whether you want to go to the car show and other events on Tuesday, or the Walk for Autism on May 4th, they will both be a fun-filled time for the family to enjoy and the community to gather together for a great cause.